AN ARTIST'S conception of the Rivoli's Todd-AO installation. Booth (A) is normally used, but booth (B) was installed in the mezzanine to demonstrate flexibility of projector as to degree of projection angle. One of the more recent of the super wide screen processes is Todd-AO. This system was given a tremendous boost when it was selected by the famed Broadway team of Rodgers and Hammerstein for the film production of their world famed musical, "Oklahoma!". The Todd-AO process is the ultimate result of intensive research by a team of research and engineering scientists headed by Brian O'Brien at the American Optical Company laboratories in Rochester, N. Y. O'Brian describes the system as "a process of motion picture photography and projection that establishes the illusion of participation in the action . . . the feeling of literally being present in the scene." One camera and one projector are used in the Todd-AO system, and does not require the three projection booths and three projectors which are required for the showing of Cinerama which the Todd-AO process is said to most closely resemble in overall appearance and effect. The latest of the super wide screen systems using over-sized film to be introduced to the public is the Todd-AO process. This article is based on information supplied by the Todd-AO Corporation and offers the reader some background on the research early experiments and the men responsible for the development and perfection of this system. In addition there is detailed information about the various pieces of special equipment that had to be devised to film and project this 70mm process. Included in this examination are the camera, the camera lenses, the projector and its component parts, the design of the curved screen and the special material required. There is also data on the installation of this system in theatres. THE TODD-AO camera was specially designed to handle the 65mm negative. A new movie process must have a new camera. The Todd-AO cameras are precision register-pin movement cameras of surprisingly small size and light weight. They were designed to take the 65mm Todd-AO negative, but in spite of the increased width of the negative, the cameras are only slightly wider and a few pounds heavier than conventional 35mm cameras. The movement is of a double eccentric and link type and is very quiet running. Special emphasis has been put on steadiness in the Todd-AO picture, and this steadiness is achieved first of all in the camera, where special attention has been given to a rugged but precise film movement. In addition to running at 30 frames per second, Todd-AO cameras also run at standard 24 frames per second; a high speed camera is also available; it will run up to 90 frames per second for special effect photography. For interior shots where special quietness is necessary, the camera carries a light fiber-glass, sound-proof blimp and a special "barney" of soft padding to surround the huge "Bugeye" lens. Each camera is equipped with a new dual-magnification focus finder as an integral part. Sixteen-power magnification is available in the center of the field to make possible unusually precise focusing. In the low magnification position, the focus finder gives an exceptionally bright, wide view of the entire field on the ground glass with reticle lines marked for the Todd-AO frame and for other aspect ratios. This permits the photographer to compose the picture to take best advantage of the various forms of print-down with the Todd-AO negative, as well as to compose the primary Todd-AO picture. The diagram illustrates the angle of coverage of the four lenses used. Unlike lenses in 35mm cameras, which vary in focal length, the Todd-AO lenses are classified according to the angle of coverage. "Oklahoma!" was photographed through four new lenses designed especially for the Todd-AO process. All of these reflect the latest developments in the art of optical design, but the most impressive is the "Bugeye" lens with a 128 degree horizontal field of view. A camera equipped with this lens can stand in one corner of a room and photograph all four walls simultaneously. For the first time, a commercial movie lens is available whose angular field matches the useful field of the human eye. Achieving this result was not easy. Professor R. E. Hopkins of the Institute of Optics at the University of Rochester, who is a consultant to American Optical, had already acquired experience in wide-angle lenses for military training devices when he was faced with the new task demanded by the Todd-AO process. Fortunately he and his scientific colleagues at the American Optical Company had already developed considerable experience in the use of automatic high-speed computing machines in optical design. With the tools provided by the American Optical Company electronic computer, they were ready to face the design of a lens of complexity previously unknown in the industry. "Bugeye" contains 13 separate glass parts ranging in size up to nine inches in diameter — big enough for a dinner plate. In addition, it includes components unique in the industry in having surfaces which are not spherical. The problem of designing lenses with aspheric surfaces is a new and challenging one, and the problem of making these surfaces is equally difficult. War-time experience of the University of Rochester and the American Optical Company led them to believe that it would be possible to produce the desired aspherical surfaces, and after much hard work, they succeeded. The human eye has an unfair advantage over a movie camera in having a deeply curved film. This is impossible in a movie camera, and is one of the reasons why the wide-angle lens must be so much more complex than the lens of the human eye. The necessity of using flat film presents the very difficult problem of "distortion". One of the many advantages of the completely integrated Todd-AO system is that it becomes possible to balance out the errors of one part by the proper design of another part. Careful design of the cameras, the printer, and the screen curvature has made it possible to show a picture essentially free from distortion. A CLIP of the Todd-AO 65mm film is seen next to a strip of standard film for comparisons. Todd-AO pictures are photographed on special 65mm Eastman color negative, and shown on 70mm Eastman color print. The pictures are not only wider than conventional film, but are proportionately higher, and a five hole pull-down is used. The main advantage of the wide film is the excellent sharpness of the picture on the screen, since less magnification is necessary. Without this crisp picture, much of the realism of the Todd-AO system would be lost. Less magnification also means less weave and jitter of the picture, and this also makes the reality more perfect. Scratches and dirt will also be less conspicuous when they begin to appear. 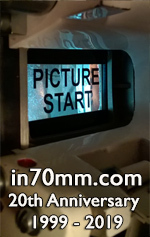 Another advantage of the wide film is the larger aperture in the projector film gate. Conventional projectors already concentrate so much light on the film during the fraction of a second that it sits in the film gate, that the life of the film is endangered. Filling a Todd-AO screen from a 35mm frame could only be done by limiting the total light drastically and destroying much of the visual sensation. This problem is solved with the wide film, and an exceptionally bright picture is possible. Although the negative is made on 65mm film, and the prints are on 70mm film, the pictures are the same size. The extra 5mm is to make room for the six channel magnetic sound whose quality is every bit as sharp and clear as the pictures themselves. The pictures are not only wider and bigger in the Todd-AO system — they come more often at a rate of 30 per second. This change is necessary because the human eye is very sensitive to movements and flickers that occur at the edges of the field of view. This sensitivity is something our ancestors developed to warn themselves of dangers not seen directly, but it makes us more sensitive to the flicker of a wide movie screen. The designers of the Todd-AO Process chose 30 frames per second, thereby permitting a clear bright picture without flicker. As a result of great feeling of realism is maintained which in turn creates a great audience participation — which is the hallmark of the Todd-AO process. Seen here is the all-purpose projector used in Todd-AO. 1. Arclamp; 2. Projector Head; 3. Upper Magazine; 4. Window; 5. Upper Fire Trap; 6. CineApergon Objective; 7. Lens Mount Bracket; 8. Upper Motor; 9. Inching Knob; 10. Belt Housing; 11. Lower Motor; 12. Upper Base; 13. Water Line Connections; 14. Cutout Electrical Leads; 15. Hold-Down Screws; 16. Leveling Screws; 17. Lower Base; 18. Arc Lamp Bracket; 19. Arc Lamp Push Button Switches; 20. Motor Push Button Switches; 21. Lower Fire Trap. The Todd-AO Projector is a new design specially built for the Todd-AO system and embodying unusual flexibility to deal with the wide variety of modern film techniques. The projector will take 70mm film or 35mm film with very minor adjustments in the mechanism, and can be changed in about four minutes. The projectors are equipped to handle multichannel magnetic sound for Todd-AO, 35mm magnetic sound for CinemaScope, or conventional optical sound. All three sets of sound equipment are provided, and the only change necessary is to thread the film through the desired sound head. AN installation diagram of the Todd-AO projector showing layout and space requirements. An unusual feature of the design is that all the mechanism, including sound heads, is included in the projector head thus eliminating the possibility of errors due to unequal film pressure. The projector includes a tilting mechanism which rotates around a high point so that there is only a slight movement of the center of gravity. Projection angles of as far down as 28 degrees and as far up as 20 degrees can be reached, so the projector can be used in upward-throw drive-in theatres. The projector has many valuable modern features including a centrifugal switch to drop the dowser if the film speed is too low, a water flow switch to cut off the arc if the cooling water is cut off, and stop switches on both sides of the chassis. The built in optical preamplifier is of a special plug-in design so that a new unit can be substituted almost instantaneously in case of breakdown. The single-bladed conical shutter cuts twice for every frame and gives a 54 per cent efficiency. Two separate motors are provided to run at 30 and 24 frames per second respectively and to provide quiet operation with a minimum gear complexity. A constant feed sprocket is provided on the magnetic film path, between the upper fire rollers and the magnetic 10 channel head; this sprocket evens out the potential jerkiness in the film as it comes out from the upper magazine — and as a result insures steady contact at all times between the film and the magnetic head. THE Todd-AO projector can easily be adopted so as to be able to project CinemaScope prints and standard 35mm prints with parts seen right. All sprockets and rollers in the projector head are made of non-magnetic aluminum or nylon with outstanding wearing abilities. The projector gate is made of tantung a special metal alloy that has excellent hardness characteristics to prevent wear and will not become magnetized. As a result, the recurring problem of degaussing is practically eliminated with the new Todd-AO projector. The 10 channel magnetic head is used both for Todd-AO sound and CinemaScope four channel sound. An additional new feature is that the lower magazine or take-up reel is driven by a vertical shaft extending from the projector mechanism, thereby eliminating the usual chain or belt drive. The most striking and significant part of the Todd-AO system is the deeply curved, concave screen. It is important to understand the visual significance of this deeply curved screen which is fundamental to the system and is responsible for many of the remarkable visual effects which would be impossible without it. Perhaps the most important visual result from the deeply curved Todd-AO screen is the distinct sensation of personal participation experienced by the audience both physically and emotionally. Another aspect of the deeply curved screen is its freedom from distorted images. Most theatre-goers are familiar with the elongated narrow figures that are seen from the side seats in the front row. Scientists at the American Optical Company conducted a series of careful experiments to see what "squeeze" could be tolerated without objection when looking at the screen from an angle. They then studied theatres to see how many seats present an objectionably squeezed picture and which seats give a good picture. The final result is that the Todd-AO system is a process for every theatre and for every seat in every theatre. The ability of the Todd-AO deeply curved screen to avoid "squeeze" is stolen straight from Euclid's "Geometry", but Euclid never thought of applying it to a movie screen. Euclid taught that for an observer standing on the edge of a circle, equal arcs subtend equal angles anywhere on the circle. On the Todd-AO screen this has the result that an observer can walk right up and lean his cheek against the screen, and still get a good view of the picture. For the theatre owner, this is important because it means that he will be able to make much more profitable use of the front seats of his theatre than he could with a flat screen. The Todd-AO curved screen is satisfying for another reason. The eyes must be focused and their angle of convergence must always be adjusted for the distance to the screen. A large flat screen has portions at widely varying distances from the audience, and their visual convergence and focus must be constantly changed. This disturbing error is effectively eliminated when the Todd-AO screen is used. When the Todd-AO screen curves deep into the sides of the audience, a new dimension becomes available which can yield striking realism. Motion is now possible towards the viewing audience and away from it. A ride now seems to carry the viewer forward into the scene as the details slip past him on either side with great realism. The Todd-AO screen is not only wide and deeply curved, it is proportionately high. Its balanced (2x1) aspect ratio gives to the movie director the privilege of composing his scenes in harmonious proportions. The sense of motion is tremendously increased because it is not longer directionally confined to one dimension. One of the scenes from "Oklahoma!" shows a crowd of people gathering together at a point of excitement. The interplay of running figures coming down from upper left, in from the left, down from upper right, and in from right catches up the spectator in the excitement of the moment, making him feel as if he were actually participating in the screen action. The Todd-AO screen introduced two very distinct problems, namely reillumination and brightness. If light shining on one part of the screen scatters onto another part, contrast is reduced, and colors are less bright. Somehow the light had to be thrown back at the audience and not allowed to flood other parts of the screen. This was the reillumination problem. The other problem was simply that of getting enough light. If the same light as is used in standard 35mm projection is spread over a screen more than four times larger, it will be only one-fourth as bright. The Todd-AO system partially overcame this problem by the use of a larger film, but in addition it was important that the screen act as efficiently as possible in redirecting the light to the audience and not wasting any of it lighting up the walls, ceiling, or the other parts of the screen. Both of these problems have now been solved by moulding and coating the surface of the screen so as to make the light go in the desired direction and no other. The result is a screen whose surface is made of plastic-coated cotton cloth. The plastic is deeply embossed with tiny rectangular mirrors (600 to the square inch) and aluminized to give high reflectivity. In each portion of the screen the mirrors are at the correct angle to direct the light where it is needed, and keep it away from where it is not wanted. The invisible seams are made strong, smooth, and free of wrinkles with the aid of a fiber-glass tape on the back. The screen surface conforms with the usual fire regulations and can be easily washed. A VIEW of the Rivoli auditorium being prepared to show the Todd-AO wide screen system. It was the first theatre to be fully equipped. Each theatre installing the Todd-AO process will buy the same basic Todd-AO projection and sound equipment; the type of projection lenses used and the dimensions of the screen will vary in most cases due to the differences in projection throws and auditorium sizes. As a general rule, the preferred screen is the largest screen that it is possible to install in the theatre auditorium. The Motion Picture Products division of the American Optical Company and the technical staff of the Todd-AO Corporation have studied in detail a great number of theatres of all sizes and can rapidly determine the most appropriate screen size, shape, and location for all types of theatres, after either examining theatre plans or surveying the theatre itself, thereby insuring the theatre owner of the best audience participation for his viewing audience. Theatre survey methods have now been devised so as to make them standard and organized to conduct; a major theatre can be surveyed in less than one day. The installation of all necessary projection and sound equipment, as well as the installation of the screen frame and screen, has been reduced to a standard procedure and to the minimum amount of time. It is estimated that a Todd-AO installation can be completed in approximately two weeks and that this installation time, with more experience and in smaller theatres can be shortened.